P. Naur and B. Randell, (Eds.). 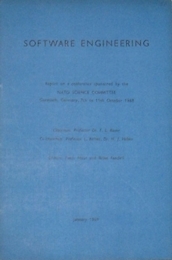 Software Engineering: Report of a conference sponsored by the NATO Science Committee, Garmisch, Germany, 7-11 Oct. 1968, Brussels, Scientific Affairs Division, NATO (1969) 231pp. B. Randell and J.N. Buxton, (Eds.). 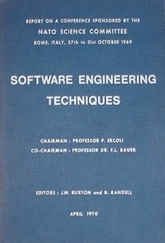 Software Engineering Techniques: Report of a conference sponsored by the NATO Science Committee, Rome, Italy, 27-31 Oct. 1969, Brussels, Scientific Affairs Division, NATO (1970) 164pp.